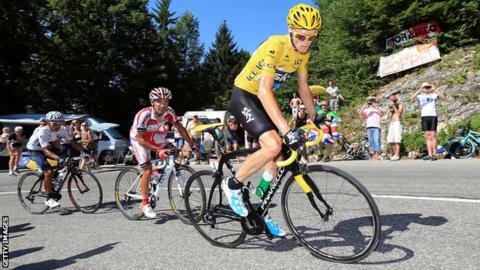 Tour de France cyclists could have cameras attached to bikes to enhance the experience of television audiences in an effort to attract more fans. International Cycling Union (UCI) president Brian Cookson believes the sport must innovate to promote itself. "We need to embrace innovation and sell our sport. We will look at technology, such as cameras on bikes," he said. "Imagine being able to share Chris Froome's view as came up the Champs-Elysees to win the Tour last summer." Cookson, who was elected UCI president in September last year, made the suggestions during a keynote speech at the Sport Accord Convention in Turkey. The 62-year-old Briton believes cycling needs to remain at the cutting edge of technology to enhance the experience of viewers. "One of the biggest challenges is the need to evolve while staying true to the essence of your sport," Cookson said. "And why stop at cameras? What about having microphones on bikes or sharing rider data on screen?" Cookson recently made a controversial proposal to move track cycling to the Winter Olympics but he maintains sport must be ready to challenge conventional practice. "The world changes and we must change with it," Cookson added. "If we, as leaders of our sports, cannot think out of the box and have this kind of discussion in good faith then we certainly run the risk of seeing our sports stagnate." Meanwhile, Belgian Cycling Federation president Tom van Damme has called for football-style red and yellow cards to improve safety in the peloton. Van Damme believes it could improve riders' discipline and lead to fewer crashes, and is calling on the UCI to act. "If riders were more disciplined, there would be fewer accidents," he said.